Will STI bottom at 2640?? After my last email, Dow Jones and STI began a 5 days slide. Dow Jones drop 300 points while STI drops 150 points this week. Some of you ask: How is STI now? 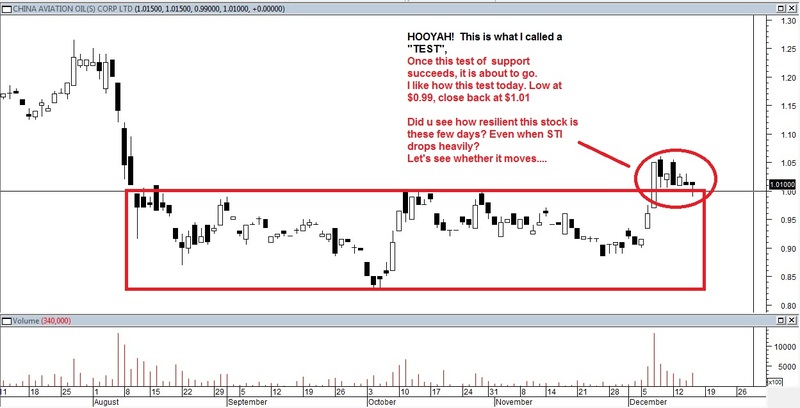 Let us look at the STI chart in the attachment. From the chart, you can see that there is a Box pattern forming: Box Top (resistance at 2910) Box Bottom (Support at 2640). The fall in October to 2530 is what Mr Hu Li Yang calls an Untidy Box re-arrangement. It suddenly drops too much out of the box. If it falls too much, it will rise back up again. A Tidy good Box re-arrangement has a time period of at least 3 months. So based on Mr Hu Li Yang's teachings, how is the STI now? 1) Look at how the STI is these few days. Especially these 3 days. See if it drops off 2640 without climbing back. My opinion is if it drops off 2600, it will go into another box with bottom at 2400. 2) If STI climbs above 2640, and makes a good run off 2640, this figure will hold, and STI will enjoy a run up to 2910. Of course, 2800 is still a small resistance. It is the 50% mark between 2910 and 2640. Btw, US data continues to show great reports with good Jobless claims report and improved manufacturing data. Good news amid the darn Europe problems. Btw, I would be giving a FREE seminar on <Singapore Stock Training Course>. To Book: Pls reply email your <Name><Telephone><Email><No of seats><Date> to book your seats NOW! Today I browsed across this Singapore Stock while using our team's invented stock scanning system: ART system - Swing Trade. 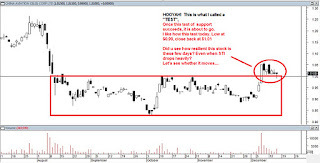 It has been some years since I talked about a Singapore Stock. This is what I called a Triple Top Breakout, with high Volume supporting! This best thing is the Box Top (what Mr Hu Li Yang mentioned: 箱顶) is a perfect round figure of $1. This is what I called a no-brainer 99% trade. A breakthrough through this resistance has potential. 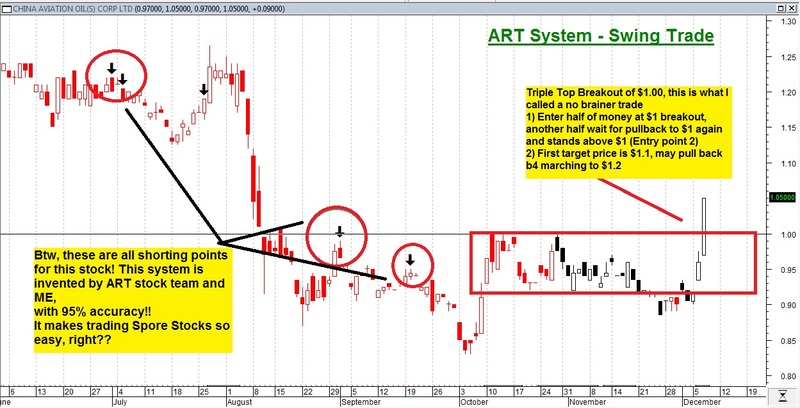 1) Enter at breakout with half the amt you wish to trade, put stop loss 10% below, like $0.95. 2) Wait for pull back to Box bottom now at $1 (if it ever bounce back) , wait for the candle to stand above $1, before entering another half of your position, putting a stop loss 10% below again. P.S. : waiting for a pullback b4 entering has a higher chance of success as all shorting traders has failed if it lifts off $1 again! 3) First resistance is $1.1, 2nd resistance is $1.2. 4) Once it reach $1.1, and u are greedy, pls put your stop loss at breakeven $1, it will rest a while b4 trying at $1.2. 5) But pls sell all at $1.2 if you are playing short term. Let us study how this trade goes. Watch carefully! Btw, the arrows in the ART system is a programme invented by our team to indicate buying or selling points with tremendous accuracy. It can scan all 600 stocks with buying or shorting arrows appearing, making trading so easy and friendly. 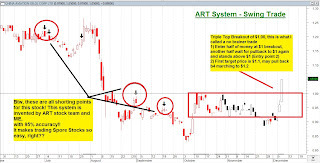 If you would like to know more about this ART system, join our Singapore stock training course on 12 Dec 2011 or 15 Dec 2011 or 28 Dec 2011. To Book: Pls reply email your <Name><Telephone><Email><No of seats> to book your seats NOW! ROSY December, Grab Energy Stocks Now! Good work! A pat on the back for me, ha! As I have mentioned in my email on 24th November, if there is a turnaround, 30th November 2011 is the date. Did u see my email? See below. Exactly on that day, Dow Jones increased by a whopping 400+ points. Can u imagine on the day that I wrote the email on the 24th Nov, it was reported that Dow Jones is poised to register the worst November in 60 years of American history. It turned around beautifully. Guess how did I know. Yes, I have been tracking US economical reports for the last 5 years. My philosophy in trading: Fundamental economic report drives the market, Technical provides support and resistance. No chartists in the world could have ever predicted such a rally on the 30th November! After last week Non farm payroll/ unemployment rate & ISM report, you would notice that, Non farm payroll did not beat expectation, while ISM did. Some of you may have think employment report is a letdown. Think otherwise! Unemployment rate decreased to 8.6%, the best since the last bear market. It's an unexpected great news! Like what I mention in last email, I expected a good Jobs report. It did. Having said that, what is the plan for December? 1) Great to accumulate some stock positions now. Technology, Energy, Healthcare, Retail all showing a turnaound. 2) Play Energy Sector NOW!!!!! Play OIL Futures, Index like "OIL", or any oil stocks you can grab! Crude Oil is making a run now! The price now is $101.57. It has the potential to reach $110. Energy stocks still in Oversold territory! 3) Play Retail Sector till January because of the christmas season! No joke, Black Friday after thanksgiving shows the highest amount of revenue collected showing that US people are getting ready for spending, making Retail stocks a fantastic buy, especially with earnings coming up in January. 4) Forget about shorting stocks NOW, like what some Gurus teach. U will be punished. Instead enjoy your christmas season! Btw, I will be having a FREE <<Understanding of the US stock market & how it affects Singapore market>> workshop on the 22nd December for you to understand about US market (in my opinion the best stock market in the world)! Past options graduates, pls recommend your friends to this workshop or help to forward this mail to them, thanks. Thank you and with regards! Santa Claus Rally has probably BEGUN!!! What a result in US today! US up by 400 points. Pls do not miss this opportunity of making it big this month in December. Get ready for the run. With today's GREAT Chicago PMI and ADP employment report, I foresee a good ISM and Non Farm payroll. But of course, we still need to see Thu and Fri! 2moro morning China PMI is something we need to pay attention too. Get your weapons ready go for a Straight Call instead when that happens! This will only be taught in Advanced Options Class! Search for the correct stocks NOW! For those that have not participate in my Advanced Options Course, pls do not miss this perfect opportunity of coming this Saturday, 3 Dec 2011. Price will be raised after this! If you think that a few hundred of dollars for this options course is high, what about the money lost in Stocks? To know the price of the course & further dates , pls call our maketing manager, Venetia @ 98755178.